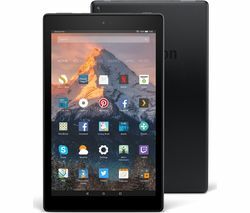 Designed to be powerful but easier on the pocket, the new range of Amazon tablets do everything you’d want a tablet to do, and at an incredibly affordable price – we have Amazon tablet deals from just £49.99. Amazon’s Fire tablets are built with families in mind. 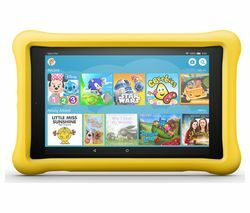 Their kid-friendly design features large easy-to-use buttons and volume rockers, and their intuitive Fire OS interface is a breeze to get to grips with. Available in a range of sizes, from 7” to large 10.1” screens, and colours – black, orange, blue and purple – it’s easy to find an Amazon tablet that’s right for you. Whether you’re looking to browse the web, shop online, catch up on social media and emails, or stream your favourite movies and TV shows, Amazon tablets make it easy. Powered by MediaTek MTK8125 processors, they zip through websites and apps – available from Amazon Marketplace – and responsiveness is great. Choose from a selection of memory capacities, from 8GB to 16GB, or instantly add extra storage space by popping in a Micro SD card of up to 128GB. Perfect for the whole family, Amazon tablets are an affordable way to get into tablet computing. If you’re looking for tablets that provide access to the Google Play store, check out our Android tablets, and if you’re looking for higher resolution models have a look at our Asus tablet range.